Put simply, a polarizer removes reflections. As powerful as today’s image processing software is, one landscape-essential filter that can’t be added after the shot is the polarizer. Used by inexperienced photographers only to darken skies, more serious photographers value their polarizers more for their ability to remove the glossy sheen that desaturates color, hides submerged objects, and flattens texture. Even worse than not appreciating their polarizer’s power, some photographers screw on a polarizer without understanding how it works, mistakenly believing that merely having a polarizer on their lens is sufficient. The amount of polarization a composition calls for is a creative decision that can make or break an image. And unfortunately, a mis-oriented polarizer can be worse than no polarizer. So what does a polarizer do? If you’re like me, it helps to understand that a wave of light oscillates (vibrates) perpendicular to its direction of motion. A real world example of this kind of motion is the way a wave in the middle of the ocean rises and falls as it advances: while the wave moves forward, the water moves up and down. A wave of light is much more complex than an ocean wave, oscillating in every possible direction perpendicular to its direction of motion. For example, to represent the direction of motion, imagine a string connecting a light source to the subject it illuminates. To understand the wave’s oscillation, picture the string moving not only up/down, but also left/right and every other angle perpendicular to the direction the wave moves. And still one more way to view this motion would be to visualize a beam of light (or our string) passing through the center of a spoked wheel, where the axle would be. Each of the spoke pairs (one on each side of the light beam) would represent a direction the wave would oscillate, and there could be an infinite number of spoke pairs. In very simple terms, polarized light is light that has all but one of its planes of oscillation removed. So returning to our spoked wheel, we’d be left only with the light that oscillates in the direction of one of the spoke pairs. Without getting too deep (or at least any deeper) into the weeds, a polarizing filter eliminates reflections by removing the light that carries reflections back to our eyes. Polarization (reflection reduction) is most effective when your lens points 90 degrees (perpendicular) to the direction of the sun or other light source; it is least effective when the lens points directly toward or away from the sun. Polarizers come in two flavors, linear and circular (the designation has to do with the way the polarizer achieves its effect, not the shape of the filter). For today’s digital cameras, you want to use a circular polarizer (which is almost certainly what you’ll be sold if you ask for a polarizer). Most polarizers are comprised of two connected pieces: a circular threaded frame that screws onto your lens’s threads, and an attached piece of polarizing glass (in its own circular frame) that rotates independently of threaded frame. Rotating the polarizer’s glass element relative to the fixed lens varies the orientation, and therefore the amount of polarization. You can see the polarization effect (sometimes large, sometimes small) through your viewfinder or on your live-view LCD. With reflections minimized by a polarizer, pale blue sky is transformed to a deeper blue, glare is removed from rocks and foliage to reveal underlying color and texture, reflections are removed from water to expose submerged features, and clouds that were barely visible suddenly snap into prominence. Or imagine mountains reflected in a still alpine lake: As you rotate your polarizer, the reflection is replaced by rocks and leaves dotting the lakebed; keep turning and the reflection returns. A polarizer costs you one to two stops of exposure, depending on the polarizer and the amount of polarization you dial in. 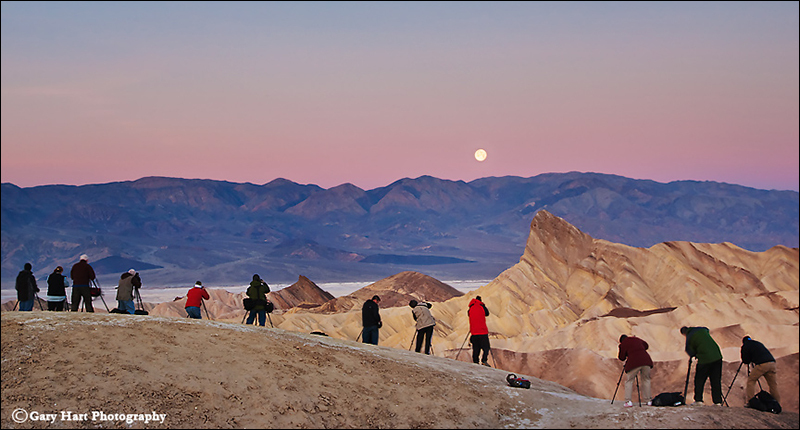 Since aperture manages depth and is often non-negotiable, landscape photographers usually compensate for the lost light with a longer shutter speed—one more reason to use a tripod. If motion is a concern, the next best way to compensate for lost light is to increase the ISO. Because a polarizer’s effect varies with the direction of the light, and wide lenses cover a broad field of view, light arrives at different parts of a wide scene from different angles. The result is “differential polarization”: parts of the scene that are more polarized than others. Differential polarization is particularly troublesome in the sky, appearing as an unnatural transition from light to dark blue across a single frame. This effect can often be reduced, but rarely eliminated, with careful dodging and burning in Photoshop. Better yet, avoid images with lots of (boring) blue sky. A standard polarizer is comprised of a circle of polarized glass mounted in a frame that screws into, and rotates relative to, the fixed lens beneath. Most also include an outer ring with threads for attaching other filters. The field of view of ultra-wide lenses can be so great that, at their wider focal lengths, they include the polarizer’s frame: vignetting. Polarizer vignetting manifests as dark edges on your images, particularly at the corners. Most of the best polarizer manufacturers offer a low-profile version that mitigates vignetting. Low profile polarizers are more money (oh well), usually require a special lens cap (a minor annoyance), and don’t have external threads (not an issue for me). Since I’m all about simplicity in the field, and determining whether or not I need a polarizer and then adding or removing it as needed is more trouble than it’s worth, each lens in my bag has its own polarizer that rarely comes off during daylight hours. During the day I remove my polarizer only when I need more light, want to use a neutral density filter (I don’t like stacking filters), or if I’m concerned about differential polarization. But. Shooting with no polarizer is better than using an incorrectly oriented polarizer. 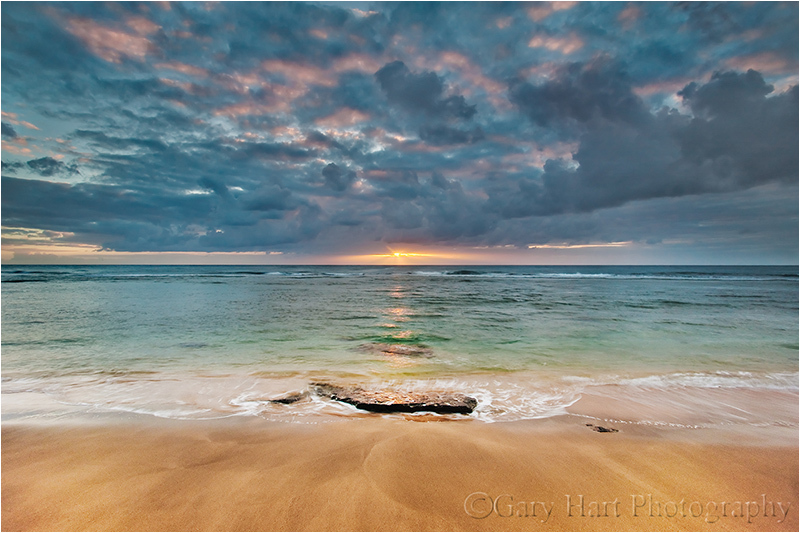 If you’re going to follow my “always on” polarizer approach, you must be diligent about rotating the polarizer and checking its effect on each composition, or risk doing more harm than good to your image. Like many photographers, I always use a filter as protection for my front lens element; unlike many photographers, I don’t use UV or skylight filters. While it’s possible to stack a polarizer atop a UV or skylight filter, I don’t. Instead, because it never comes off, my polarizer doubles as protection for the front lens element. Given that my polarizers are in the $200 range, this gets a little expensive when a filter “takes one for the team,” but it’s cheaper than replacing an entire lens, and more desirable than stacking superfluous glass between my subject and my sensor, not to mention the vignetting stacking causes. On the other hand, I will use a graduated neutral density filter with a polarizer, because GNDs serve a specific (not superfluous) need that doesn’t disappear when a polarizer is added. To those photographers who complain that it’s a real pain to rotate a polarizer with a lens hood in the way, I have a simple solution: remove the lens hood. I never use a lens hood. Ever. This is blasphemy to many photographers, but I hate lens hoods, which always seem to be in the way (see my “simplicity in the field” comment above). But (there’s that word again), jettisoning the lens hood must come with the understanding that lens flare is real and usually impossible to entirely correct after the fact. When there’s a chance direct sunlight will strike my front lens element, I check to see if shielding the lens helps. With my composition ready (on my tripod! ), I peer through my viewfinder and shade my lens with my hand or hat (or whatever handheld shade is handy). If shading my lens makes the scene darker and more contrasty, and/or lens flare (random fragments of light) disappears, I know I must shield my lens while exposing. Of course if the sun is in my composition, no shading in the world (or lens hood) will eliminate the lens flare. All scenes don’t benefit equally from a polarizer, and photographers on a budget can’t always afford one for every lens. If you’re only going to go with one polarizer, buy one for your largest lens, and step-up rings for each lens thread size. Or you could simply hand-hold the larger polarizer in front of the smaller lens (as long as you’re on a tripod). Does this scene call for a polarizer? To determine the polarizer’s effect, rotate the outer element 360 degrees as you peer through your viewfinder (or view the LCD in live-view). Often just holding the polarizer to your eye while you look in the direction of your composition and rotating it slowly is enough to determine its benefit. Unless I’m trying to maximize a reflection, I rotate the polarizer until the scene appears darkest. If there’s no apparent change, I watch specific objects that might have a slight sheen (water, a leaf, or a rock) as I rotate the polarizer—I can almost always find some change. Shooting with a mirrorless camera, I have the benefit of a histogram in my viewfinder. Sometimes when I can’t detect a difference with my eye I can see the histogram shift slightly to the left (or my highlight alert “zebras” shrink) at the point of maximum polarization. If you can’t see any change as you rotate your polarizer, you probably don’t need to worry about orienting the polarizer. As nice as the the effect on the sky is, it’s the polarizer’s more subtle ability to reduce glare in overcast or shade that I find irreplaceable. Peering through your viewfinder (or watching your LCD if you’re using live-view), lock your eyes on a reflective surface and rotate the polarizer. The effect is most obvious on water, or wet rocks and leaves, but even when completely dry, most rocks and leaves have a discernible sheen. As you rotate the polarizer, harsh glare is replaced by natural color and texture; continue rotating and the glare reappears. The glare is minimized when the scene is darkest. Regardless of the effect, there’s no rule that requires you to turn the polarizer to one extreme or anther (maximum or minimum reflection). Sometimes I want a little reflection plus a little submerged lake or river detail. In these situations I rotate the outer element slowly and watch the scene change, stopping when I achieve the desired effect. In the North Lake autumn reflection scene at the top of this page, I was able to find a midpoint in the polarization that kept the best part of the reflection (the mountains and trees), while still revealing the submerged granite rocks at my feet. 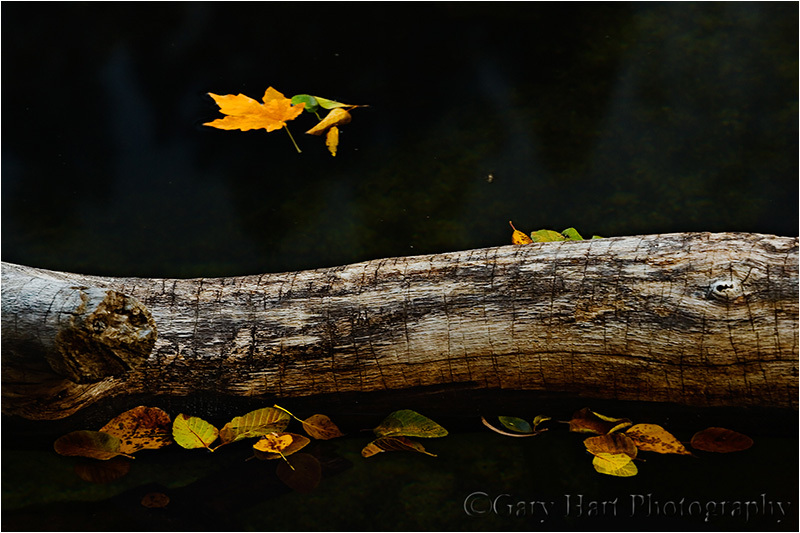 In the above image of autumn leaves floating in the Merced River, I used my polarizer to completely dial down the reflection, creating the illusion of leaves suspended in empty space. Polarizing away the reflection also helped the leaves’ color stand out by eliminating distracting glare. A polarizer can also be used as a two-stop neutral density filter by dialing it to maximum polarization (minimum light). 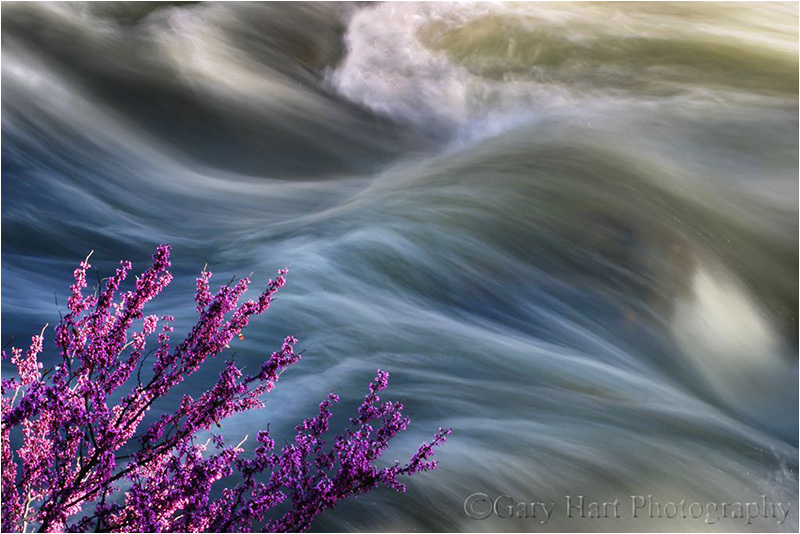 In this image of a redbud above the surging Merced River, even at ISO 100 and f32, I couldn’t reach the 3/4 second shutter speed that would give me the motion blur I wanted. But the two stops of light I lost to my polarizer was just enough to get me where I wanted to be. Use only quality polarizers; you don’t need to spend a fortune, but neither should you skimp. Not only does the quality of the optics affect the quality of your results, I’ve also seen many poorly made polarizers simply fall apart for no apparent reason. I advise buying polarizers that are commensurate with your glass—in other words, if you have top-of-the-line lenses, it makes no sense to use anything but top-of-the-line polarizers. I use Breakthrough filters because for their quality and emphasis on customer service. Like anything else in photography, using a polarizer is an acquired skill that improves with use. You don’t need to immediately jump in with both feet, but I suspect once you tune in to the polarizer’s benefits, you’ll have a hard time photographing nature without one. Serenity, Waterfall on the Road to Hana, Maui :: Some waterfalls exhilarate, others soothe. When you shot the Grand Canyon from the raft…did you use a polarizer?